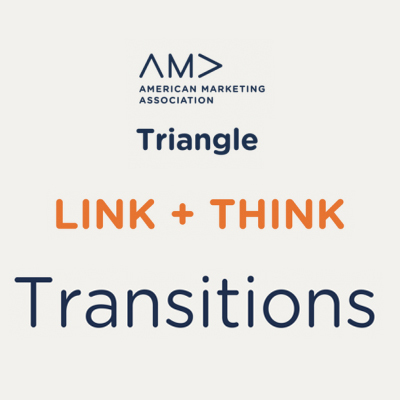 If you are looking for a marketing position, make sure to register for the next Triangle AMA Transitions Link + Think Workshop. This workshop is held on the first Monday of each month at 12 PM at the RTP Frontier in the Fusion Room. Lean great skills, hear helpful information, and network with other passionate marketers! This month’s workshop is based on Carol Linden’s job seeker survey which resulted in a chapter in her book, The Job Seekers Guide for Extraverts and Introverts. Very pragmatic information in a highly interactive discussion of what works in a job search, based on information of those who have gone before you. We don’t all need to learn things the hard way. Hope to see you at the workshop.